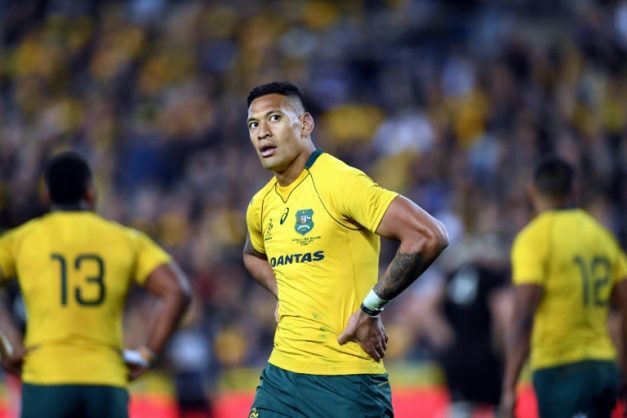 Wallabies star Israel Folau says he has no regrets about saying gay people would go to "hell"
The controversial star player says Australia are reaching their true potential. Australia are beginning to reach their true potential, star fullback Israel Folau said Tuesday, vowing to unleash his aerial prowess against the world champion All Blacks. Folau received a one-match ban after his last international outing when he sent Ireland skipper Peter O’Mahony sprawling in a clash for the high ball during their contentious final Test. Despite the incident, the 29-year-old said he would not hold back in Sydney against the New Zealanders, who possess their own potent aerial weapon in Jordie Barrett. “I believe my technique is fair play and I’ll attack the ball at every opportunity I get to try to win possession for the team,” he told reporters ahead of Saturday’s opening Rugby Championship match at ANZ Stadium. Folau, who dismissed speculation he would play in the centres rather than at fullback, believed Australia were closing the gap on the back-to-back world champions. He said Saturday’s match, which doubles as the first fixture of the three-Test Bledisloe Cup, was a chance to build on Australia’s 23-18 win the last time the two sides met in Brisbane last October. “Last year we really built a good foundation within our team, we came so close in the second game and managed to get the win in the third one,” he said. Utility back Matt Toomua said Australia wanted to make amends for the heavy losses suffered in the past two matches against the All Blacks in Sydney — going down 42-8 in 2016 and 54-34 last year. “We owe the Sydney crowd something,” he said. Toomua is back with the Wallabies after a two-year absence and said he had learned a lot playing in England for Leicester Tigers, where he will stay until mid-2019.